After 25 years of ministry as a priest, Father Pat Travers says he has a “sense of confidence and gratitude” for the Lord leading him on the path to his vocation. He shared that though his job with NOAA was very interesting, it was also a big task to take on early in his career. “One of the main sources of support I turned to was the Cathedral parish,” Father Pat said and living downtown in the Mendenhall apartments, a block away from the Cathedral, made it easy for him to become involved in the parish. A few years later, Father Pat recalled having conversations with Fr. Jim Cronin, pastor of the Cathedral, who brought up the idea of priesthood to him. It was these talks with Fr. Cronin that led Fr. Pat to serious discernment of his vocation. To discern God’s calling, he decided to leave Juneau and transfer back to Washington, D.C. where he wouldn’t be distracted by his job. While in D.C., Father Pat discerned whether to become a priest in the Diocese of Juneau or with the Norbertine Community in New Mexico. Eventually he decided to join the Norbertine community. “In the end, I decided that unless I gave it a try, I would always wonder if I should have.” So, in the fall of 1988, Father Pat left his job on the Mike Dukakis presidential campaign to join the Norbertines in New Mexico. At the end of his first year in New Mexico Father Pat took temporary vows with the Norbertines and was sent to Rome to study theology at the Gregorian University. Father Pat spent three years in Rome studying theology during his formation, but said about a year into the process he began questioning if the Norbertine community was really where he was being called. He said he was feeling called to a pastoral ministry working in a parish, something that wouldn’t be his focus as a Norbertine. 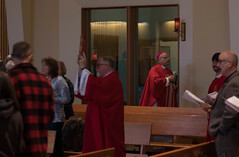 After his three years in Rome and his temporary vows with the Norbertines expired, Father Pat returned to Juneau, where he discerned the priesthood in the Diocese with Bishop Michael Kenny. After a couple of months, Bishop Kenny ordained Father Pat a deacon for the Diocese of Juneau. With a background in law the Bishop asked Father Pat to return to Rome for two years to receive a canon law degree. After his first year of Canon Law, Father Pat was ordained a priest on July 7, 1993 by Bishop Kenny. 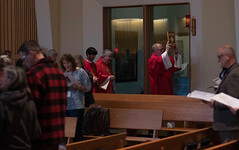 Father Pat’s ordination was only the second time a priest had been ordained in the Cathedral of the Nativity in Juneau, with the previous ordination taking place in 1918. In the years since his ordination, Father Pat has served as pastor at Holy Name parish in Ketchikan and St. Paul the Apostle in Juneau twice, as well as Saint Catherine of Siena in Petersburg. He says as a priest he’s enjoyed working in the parish and serving God’s people by celebrating Mass, offering confession and counseling parishioners. Outside of his pastoral role, Father Pat also serves the diocese as Vicar General, Judicial Vicar and Chancellor. He also serves the Archdiocese of Anchorage and the Diocese of Fairbanks as their Judicial Vicar. His ministry as an Air Force Chaplain has continued and in April he advanced to the rank of Colonel. When asked if he thought he would take on the many roles he had sice he began seminary Father Pat replied, “When I initially went to the seminary with the Norbertines, I really wasn’t anticipating any of it.” When he decided to join the Diocese of Juneau he said with his background as a lawyer, he expected he would have a role with Canon Law work. Father Pat Travers will celebrate his 25th Anniversary of Ordination into the priesthood, Saturday, July 7th.